Bruckner's Second Symphony is not usually counted among his finest works, but listening to a performance of this quality it is difficult to tell why that should be. Marcus Bosch and his Aachen forces don't make any concessions to the score, they approach it as if it were the Eighth or Ninth, and in doing so uncover levels of depth and sophistication wholly absent in most recordings. There is a sense of life in every phrase, partly a result of sensitive tempo fluctuations and partly the commitment of the players, that allows everything to make perfect sense. This is an expansive reading, yet there is never any suspicion of megalomania or redundancy – a rare achievement indeed. The recording was made in the St. Nikolaus Kirche in Aachen, a grand, Gothic edifice with a very high ceiling. Recording Bruckner in churches and cathedrals is a risky business, you inevitably loose clarity of detail. 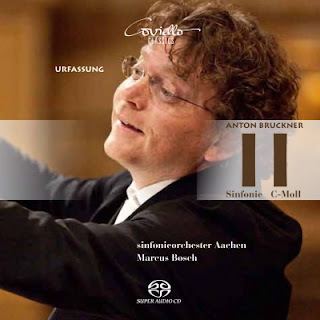 But the essence of Bruckner is not in the detail, it is in the bigger picture, and if the conductor and orchestra can work with the acoustic, the results can be magisterial. And that is exactly what happens here. The disc is the penultimate in a Bruckner cycle (assuming they are leaving out No.0 and No.00), and the seven recordings they have previously made in the venue have given them an innate feeling for which tempos work, and for the gaps required between phrases for the decay. Resonant as the space is, it has a clean acoustic with an even decay, ideal for a recording such as this. The combination of a resonant acoustic and high quality SACD audio leads to paradoxical virtues. Rather than show off the detail of the orchestral sound, the audio instead intensifies the sense of atmosphere. The engineers have clearly taken measures to include the spacious acoustic in the recording, but the orchestra never feels distant. And the quality of the orchestral playing helps to bring the effect off. The strings play with fantastic ensemble, the brass sound is punchy but always round, and the woodwind solos are all distinctive and lyrical, even the bassoon in the Adagio. A lesser orchestra could easily be defeated by the emulsifying effect of the acoustic, but this orchestra is more than a match for it. The other potentially radical choice is the use of the 1872 'original' version of the score. The main difference between this and the better known Nowak edition is that the scherzo comes second and is considerably longer than in the later edition. But it never outstays its welcome, and given that the whole symphony still fits comfortably on a single disc, there seems little justification for the edits (admittedly Bruckner's own) that are now considered the norm. The highest musical honours should go to Marcus Bosch, who coordinates and energises this extraordinary performance with insight, energy and passion. Given the acoustic, you might expect generally slow tempos, but he knows that his orchestra has the timbral focus to keep things together at faster speeds. The first movement in particular is taken at a satisfyingly brisk pace, and the scherzo also gets some healthy propulsion. On the other other hand, the adagio and the quieter passages in the finale make the most of the resonance by pulling back and revelling in the moment. None of the tempos are extreme, but they are always fluid, allowing each of the mighty phrases to breath and to unfold at its own pace. A great recording then, and one that amply demonstrates that high quality audio is not just about highlighting the details. It might be asking too much to expect this disc to convert Bruckner sceptics, but if you have a taste for the man's later work and have previously been unmoved by the Second Symphony, then this could be the disc to change your mind. Marcus Bosch doesn't do anything very much that hasn't been done before, but somehow it all comes together in a way that few manage with this work. Highly recommended.